As a Master Gardener, I spend most summer Saturdays at the farmer’s market. 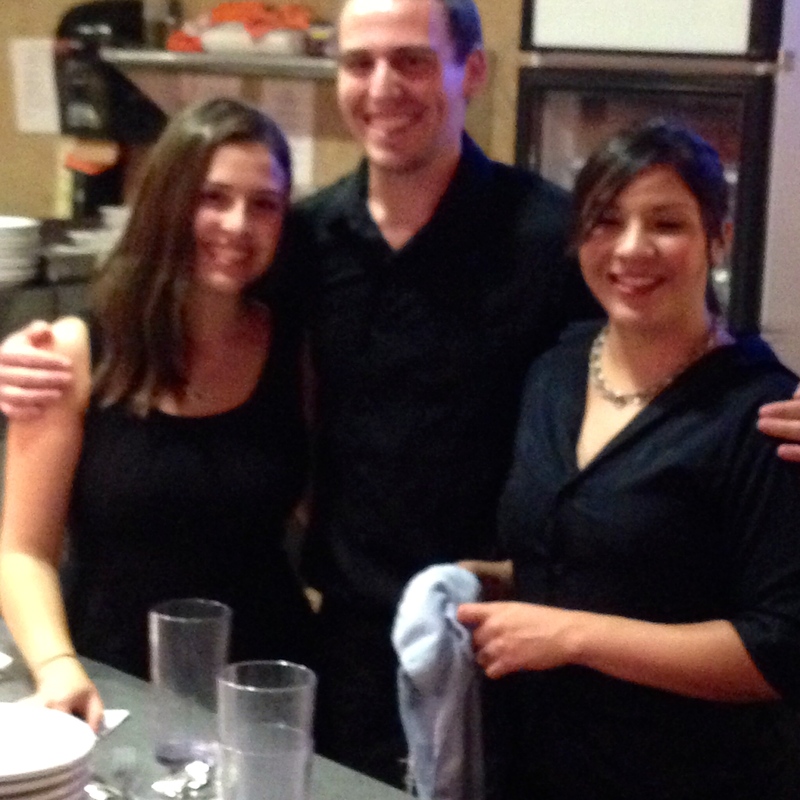 Over the years I’ve been doing this, friendships have evolved with many of the vendors. From time to time, I’ll be sharing thoughts about them and experiences with their products. 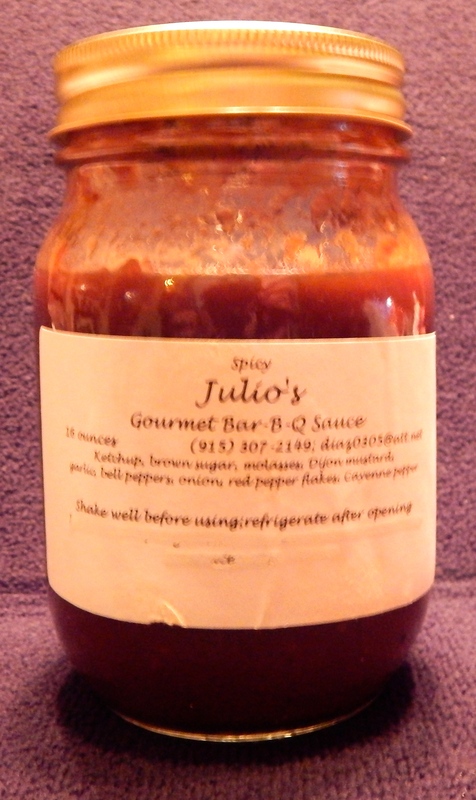 I’ve raved about Julio’s Gourmet Barbecue Sauce in several posts. I’ll continue to do that because it is so good! Julio’s wife, Paula, and I knew each other for years when I was working at Texas Tech Health Sciences Center in El Paso and she was a section editor at the El Paso Times. Her editorial skills are sorely missed by readers of the paper. I keep tabs on Paula through Julio at the market. 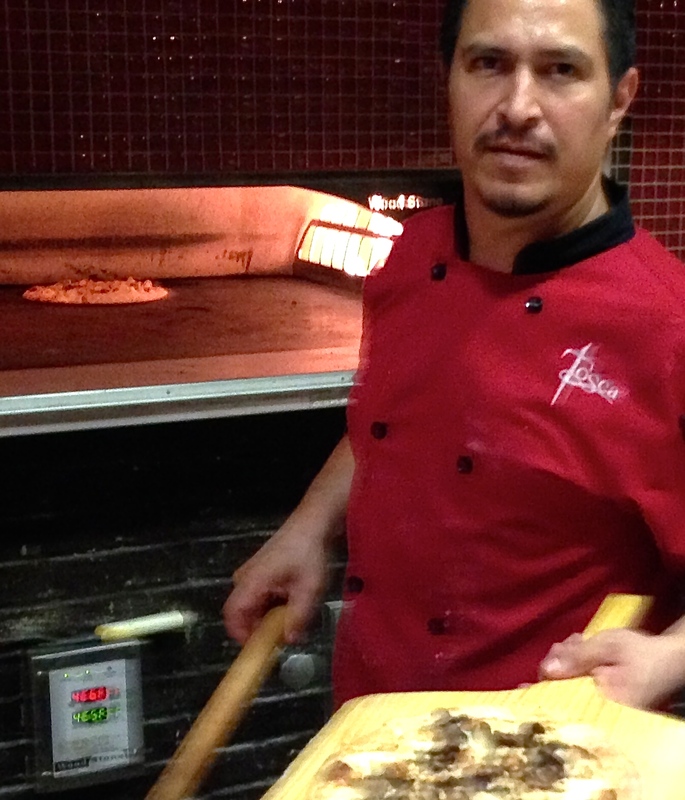 I first started chatting with Julio over tastes of his sauce on bites of beef he prepares on a tabletop grill. Those tidbits are a regular temptation on market Saturdays! I always brag to other shoppers about how he taught me to use the sauce on grilled salmon. 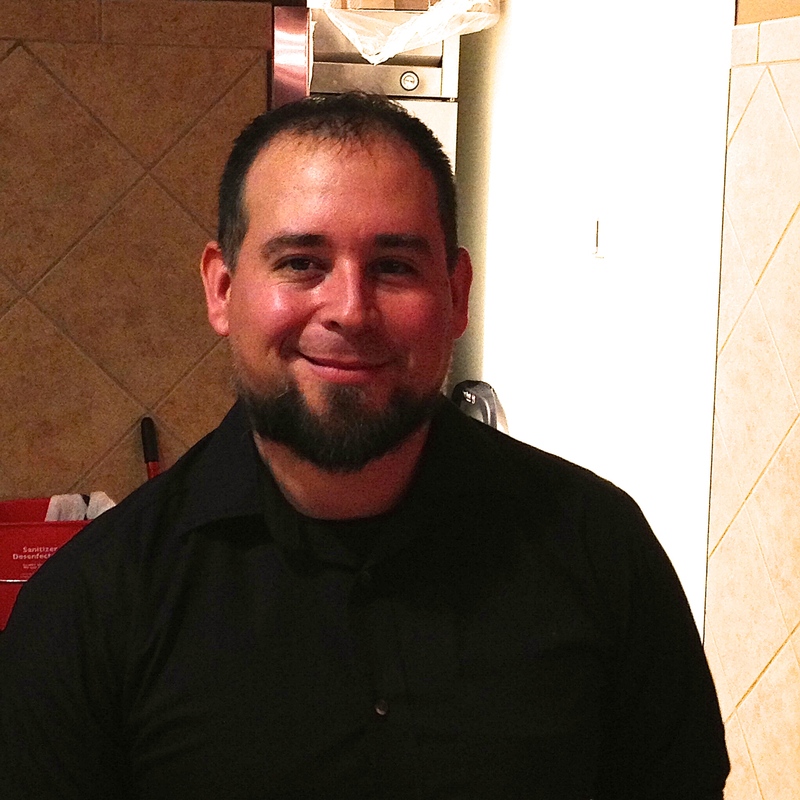 Julio the barbecue sauce master! There are mild and spicy versions of Julio’s sauce. I’m hooked on the spicy one. 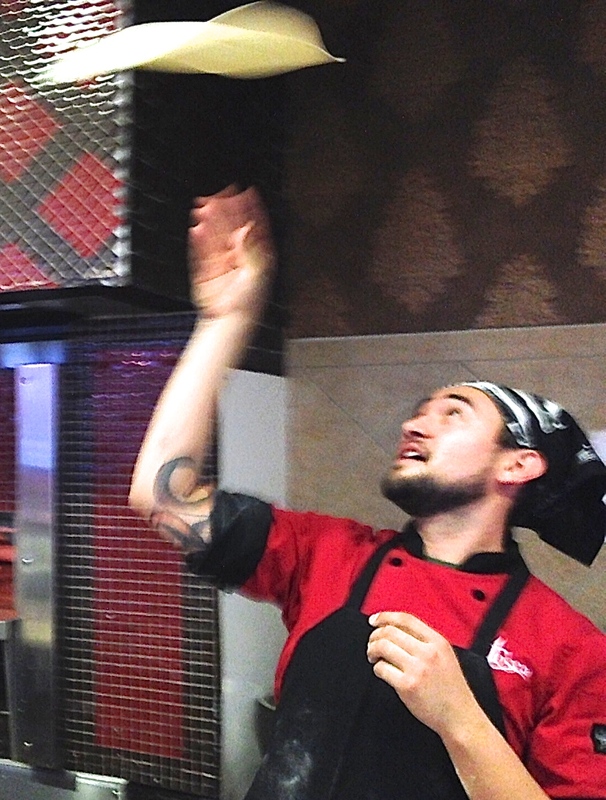 When Julio told me to try the sauce on salmon, I thought that was one of the strangest things I’d ever heard. I took it as a challenge and gave it a try. I’ve been using it on grilled salmon ever since. Be brave and give it a try. Last night was a Julio Salmon night. Keta salmon simply slathered in lemon juice, grilled with indirect heat (no fire under the salmon, just near the thick side of the filet) until it starts to flake, then brushed two times with Julio’s barbecue sauce. The deep color of the keta salmon and the rich red of the spicy sauce make it almost look like a rib rather than fish. 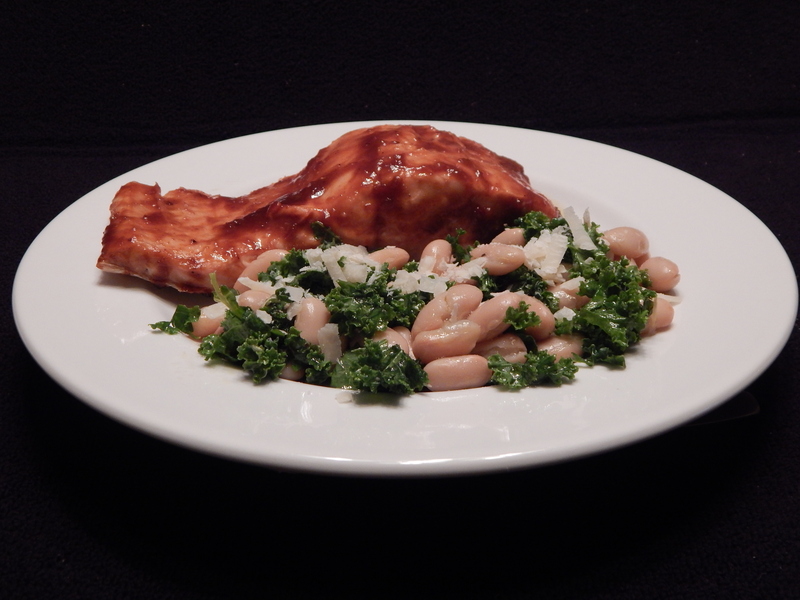 On the side, is a simple salad of curly kale and white beans dressed with lemon zest, lemon juice, minced garlic, an anchovy filet and olive oil. OMG, what did I do? I prepared a very healthy meal. It happens from time to time. Thank you, Julio, for introducing me to barbecued salmon. 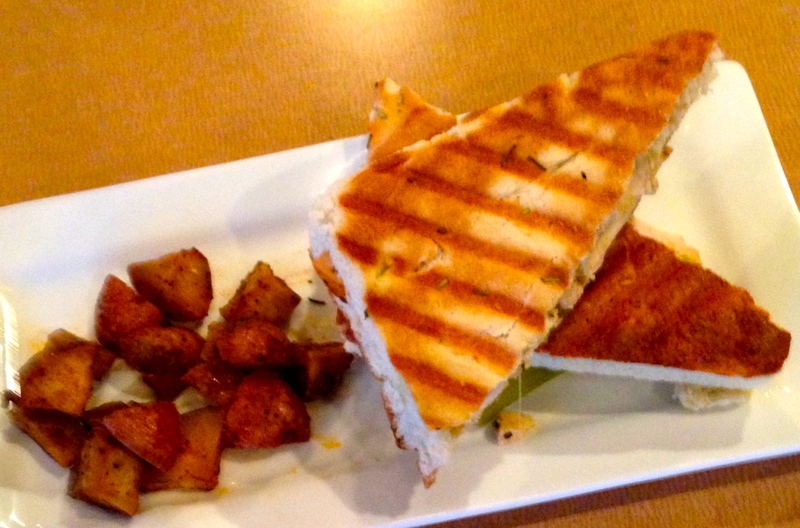 Earlier in the week, we went to breakfast at a local Mexican restaurant called Delicias. 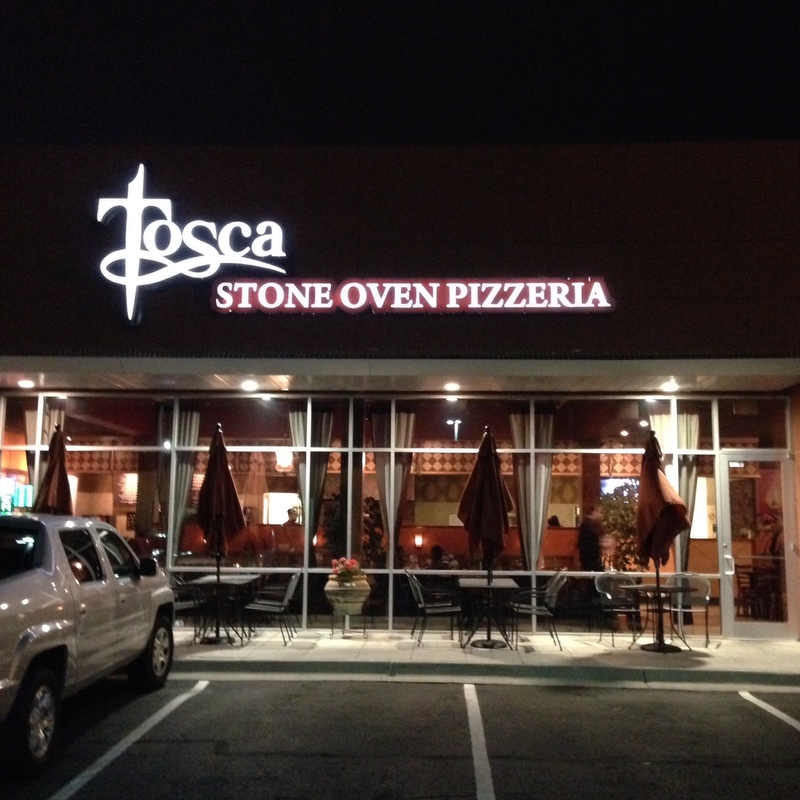 It is named after a town in Northern Mexico and the the food lives up to the restaurant’s name. I had chilequiles with Delicias Sauce. Chilequiles are strips of tortilla, sometimes fried, sometimes a little dried out and served with a sauce that they soak up. 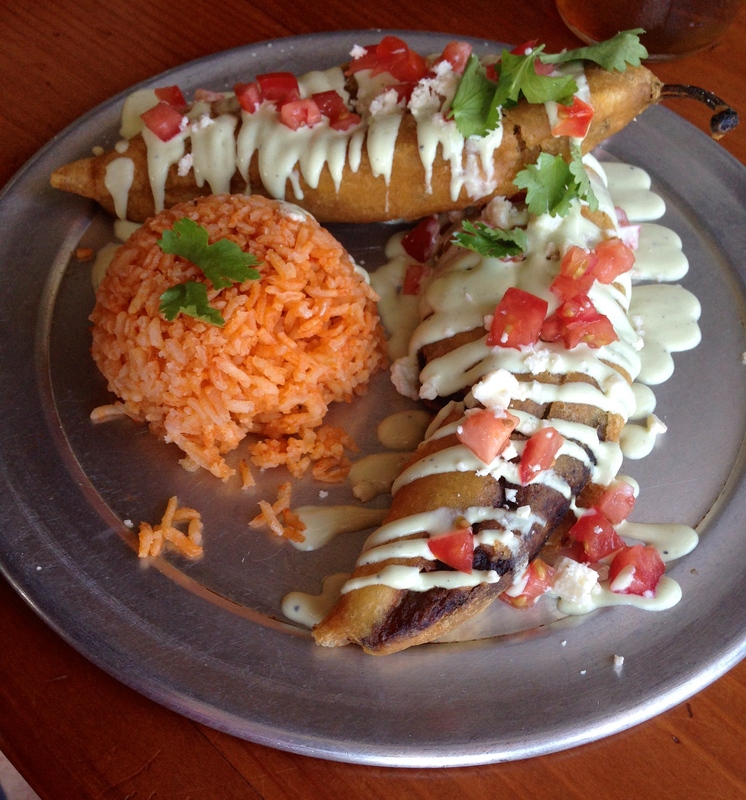 They can be served with red sauce or green sauce. 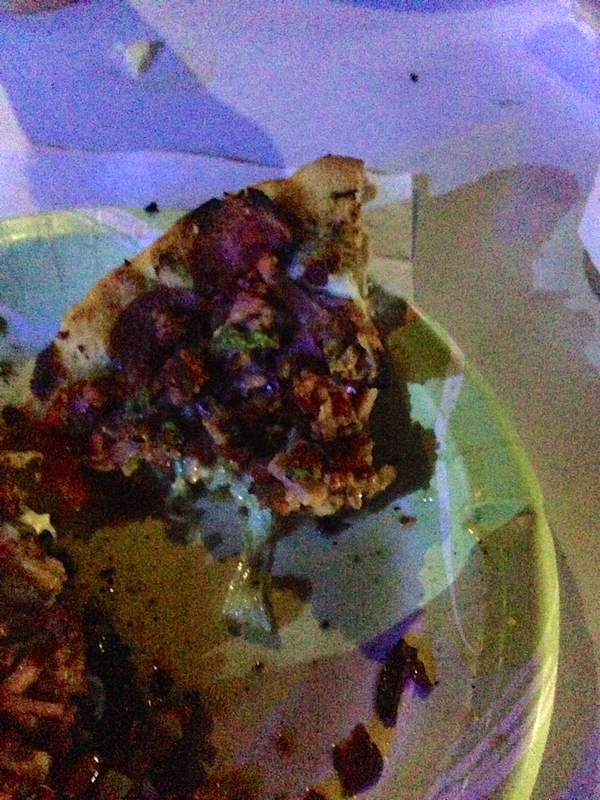 I had them with a very special Delicias Sauce. 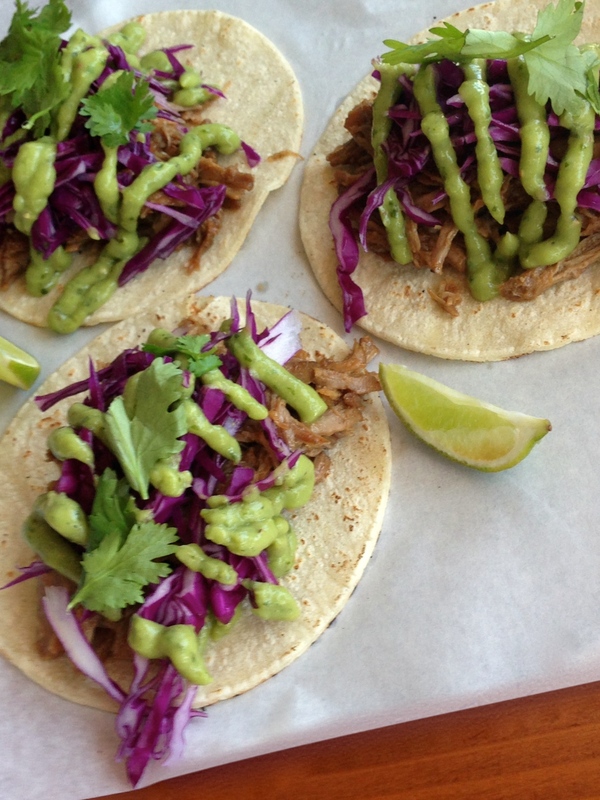 The sauce is very simple – tomatillos, serrano peppers, onion and salt, boiled, pureed and served in a variety of ways. The tomatillos have a little bit of acidity and a little bit of sweet and it was almost as if there were lime juice in the sauce. The cook assured me there was none. I really like tomatillos and should use them more often. Thinking about the Delicias Sauce, I was inspired to make a Delicioso Sauce of my own. I grilled a dozen tomatillos until they began to soften and get a little char. I also grilled a half dozen serrano chiles and five small onion wedges until the chiles began to darken, their skin starting to blister and the onions were softening. I chopped the tomatillos and onion and pureed them in my blender; then I added a good pinch of salt and one chopped serrano. 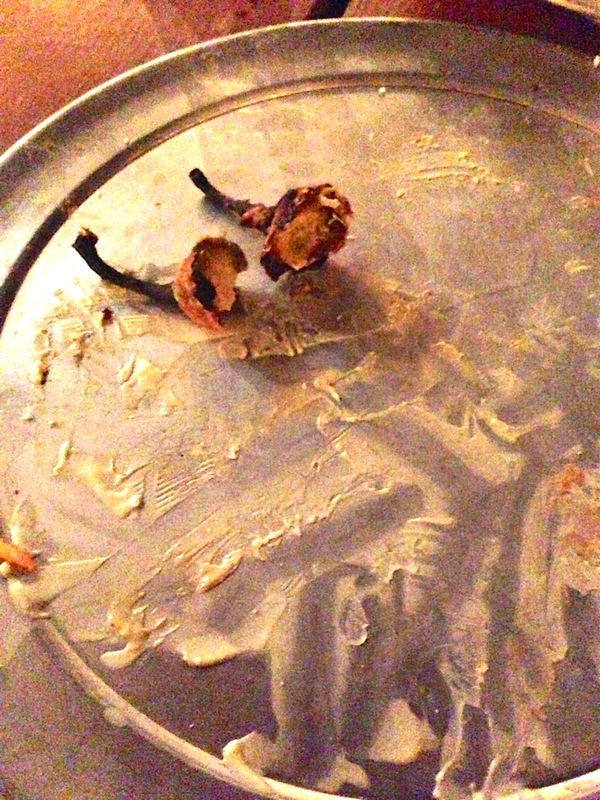 I tasted the sauce after pureeing the serrano and then added a second. Two serranos were enough to add a little heat to the sauce, but not enough to overpower the great flavor of grilled tomatillos. When working with serranos, remember you can always add more, but you can’t take it out if you overdo it. I call my version of the sauce Delicioso. Last night, I served the sauce on grilled pork loin chops with a side of pinto beans and a simply dressed romaine and radish salad. Sadly, it was late and dark and I didn’t shoot a photo. This morning, I woke craving more tomatillo sauce. I decided to do a riff on huevos rancheros: two pan softened (not fried) corn tortillas topped by my Delicioso Sauce and queso fresca, a Mexican farmer’s cheese that crumbles like feta, and a pair of fried eggs. A couple of spoonsful of leftover pinto beans and breakfast was extra special. If I had added hashed brown potatoes, I might have sworn I was back at Delicias. It all started with a craving and leftover beans and tomatillo sauce in the fridge. 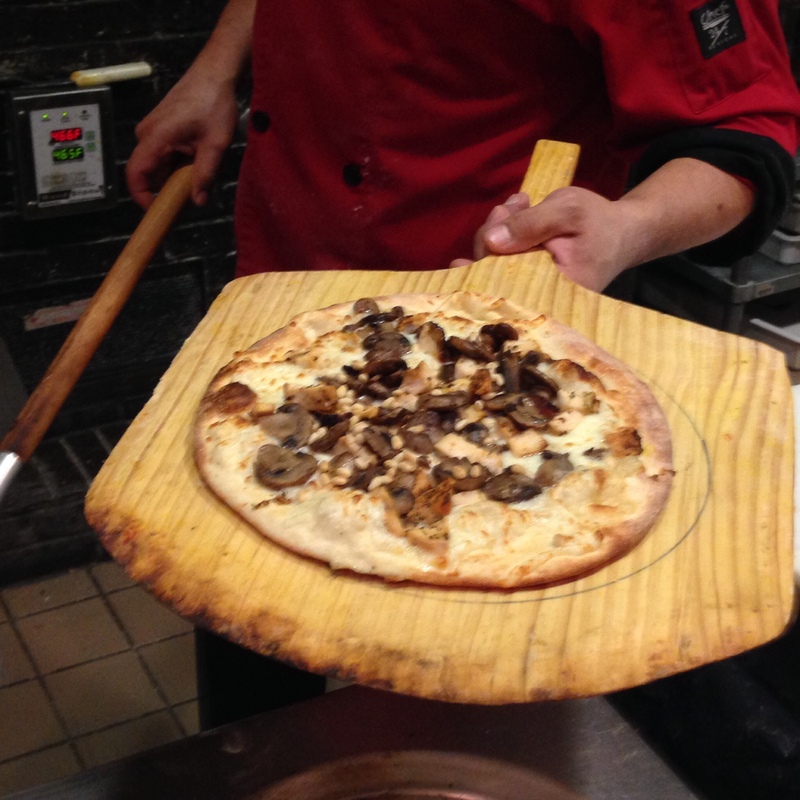 There’s a little more Delicioso Sauce, maybe with a grilled chicken breast next time? 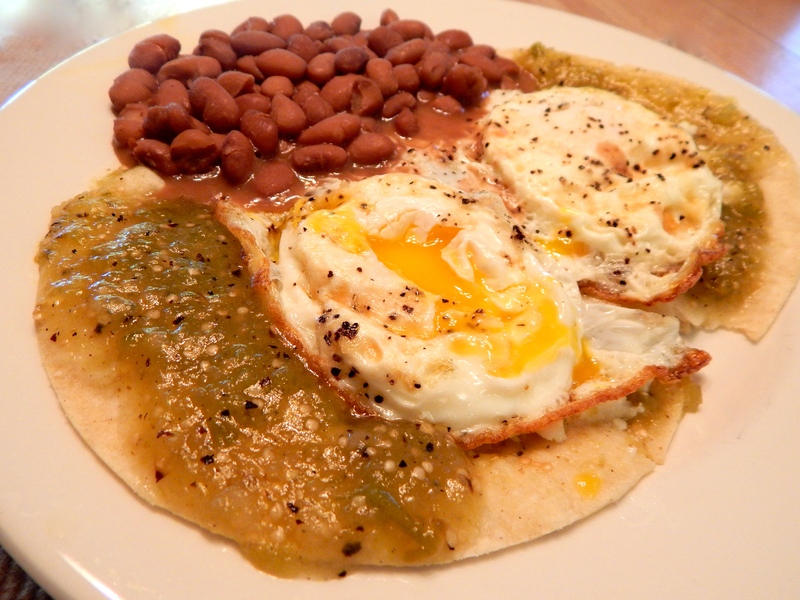 Huevos rancheros with Delicioso Sauce inspired by Delicias’ cafe’s Delicias Sauce made breakfast special. White soup, white bowl – the picture of bland? NOT SO! This bold flavored soup has a base of leeks, fennel and parsnip sweated in a little butter until tender. The savory vegetables were simmered in a pear juice reduction followed by the addition of chopped cauliflower and diced pear chicken broth. 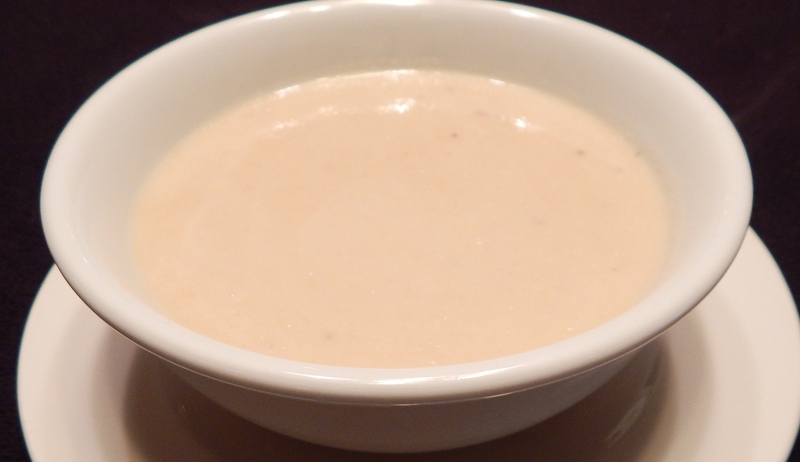 When the cauliflower and pear were cooked soft, the mixture was pureed in a blender. 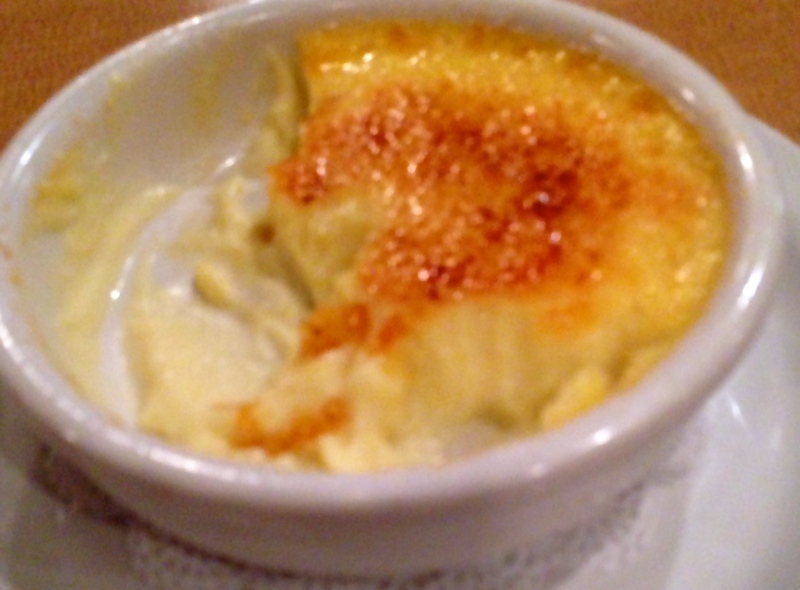 The puree was returned to the pan and a little cream and lemon juice were stirred in as it reheated. This amazing flavor combo is a keeper in the recipe file. If I had had a little fresh French tarragon, I’d have used it for garnish and a little color accent for the soup. Melt butter in a 4-quart saucepan over medium heat. Add the leeks, fennel, parsnip and 1 tsp. salt and 1/2 tsp. pepper. Cook, stirring occasionally, until soft – 5 to 8 minutes. Add the pear juice and simmer, stirring occasionally, until the liquid is reduced to a syrupy consistency. Add the broth and bring to a boil. Add the cauliflower, pear and another 1 tsp of salty and 1’2 tsp of pepper. Reduce heat to medium low, partially cover and cook until the cauliflower is very soft, about 40 – 45 minutes. Stir in the tarragon. Working in batches, puree the soup in a blender until smooth and transfer to a large bowl. To puree hot foods in a blender, remove the knob from the appliance lid. Add the hot foods, put the lid on the blender and and cover the hole with a folded kitchen towel. This will allow the hot food’s steam to vent out of the blender safely without blowing the lid off and coating you and the kitchen with hot puree. Return the soup to the original pot and stern in the cream and reheat. Stir in the lemon juice and season to taste with salt and pepper. Serve topped with a thin swirl of cream and a sprinkle of tarragon. Having that soup as a first course called for something extra special for dinner. Yesterday was another lucky day at the used meat bin. More veal chops! I lightly breaded the chops and sautéed them. While they rested, I made a pan sauce flavored with juice from the rest of the lemon used in the soup. 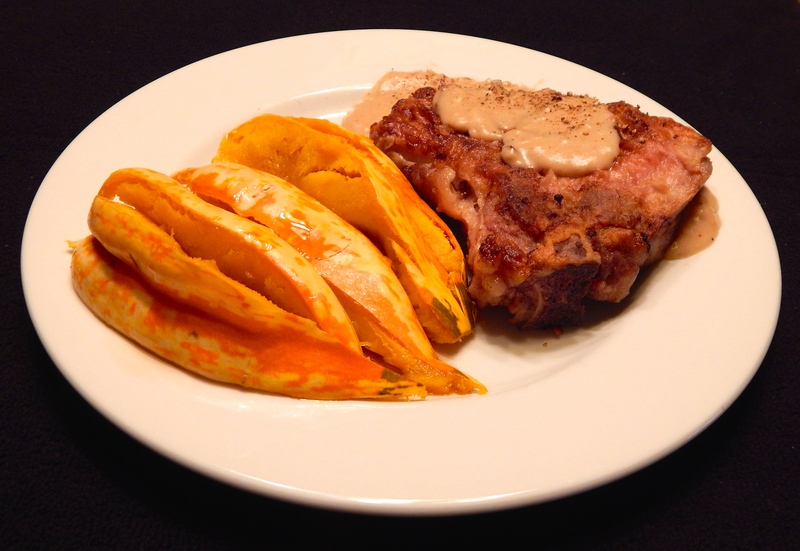 On the side I served a “Carnival” acorn squash, sliced and drizzled with a couple of teaspoons of maple syrup. While green acorn squash have a tender and edible skin, learned that the Carnival squash skin was not tender when cooked. It was pretty on the plate, but the flesh had to be spooned out of the slices. Next time, I’ll serve it in halves or quarters to make scooping a little easier. That squash is so colorful that it would be criminal not show off the multicolored skin on the plate. Carnival squash’s tough skin was a surprise. The tender veal chop compensated for it nicely. Plating dinner. Slicing a top sirloin steak against the grain and on the bias gives you the most tender bite. Paired with a 4 oz. 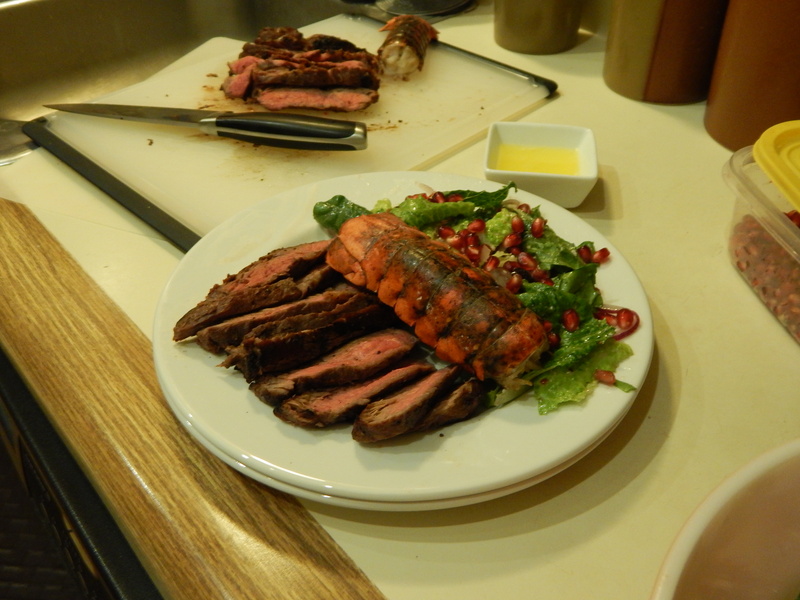 lobster tail and a crispy salad, it’s hard to be for a quick and easy meal. After a long day, it’s good to whip up something simple on the grill. A top sirloin steak is a tender, yet lean cut of beef. I grill it to an internal temp of 160 for a nice medium rare. When I discovered that 4 oz. lobster tails were on sale, I had to have some to go with the steak. A salad of romain, Kalamata olives, queso fresco and grape tomatoes was just right when tossed with a pomegranate vinaigrette and sprinkled with pomegranate arils. Clarified butter in the small bowl made the grilled lobster tail perfect! I zap butter at 10 to 15 second intervals in the microwave. The butter melts quickly and the milk solids form quickly. It is easy to skim off the solids with a teaspoon and have clarified butter in just a couple of minutes, depending on the volume of butter you are working with. How often to you run in to rack of goat at your supermarket? Not often, I’ll wager. It is worth searching for if the meat is from farmer’s you know. Tierra del Sol Farms is a family owned and run operation at Ft. Hancock, Texas. The Delgado family raises sheep and goats and they keep chickens and rabbits. They have a green house for vegetables. They operate their own USDA approved processing plant for their meats. 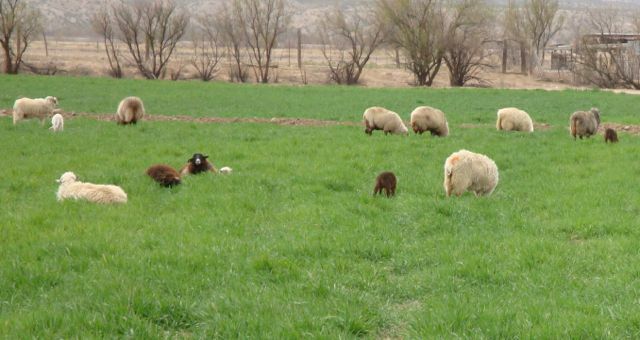 Their livestock is strictly grass fed in pastures that use no chemical fertilizers or pesticides. A pasture on the Delgado family’s Tierra del Sol Farm. Last night, I grilled rack of goat over a lump charcoal fire. The goat was marinated in a loose paste of chopped fresh rosemary and garlic in olive oil. The marinade was a nice compliment to the rich flavor of the meat. I served the chops on a bed of charred broccoli and cannellini beans tossed with a dressing of lemon juice, minced lemon zest, minced anchovies and grated parmesan cheese in olive oil with a little salt and pepper. 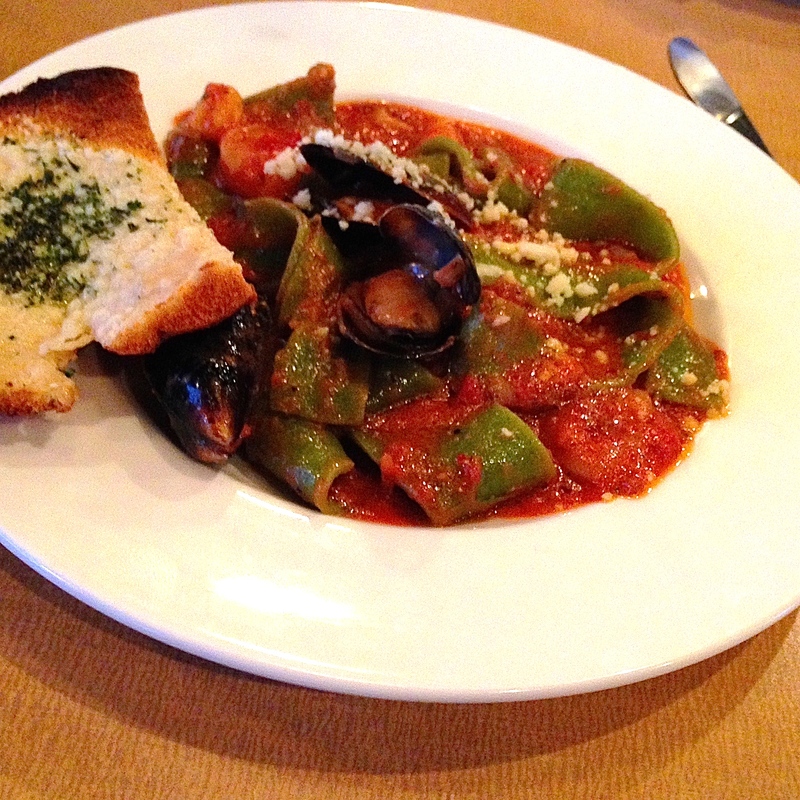 A few slivers of parmesan were a bonus garnish. 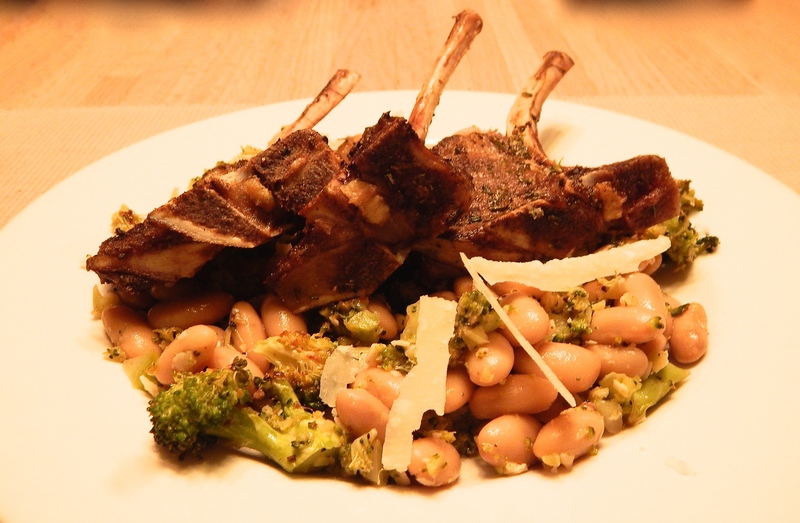 Rack of goat on charred broccoli and cannellini beans. Great flavors destined to appear on my table again. 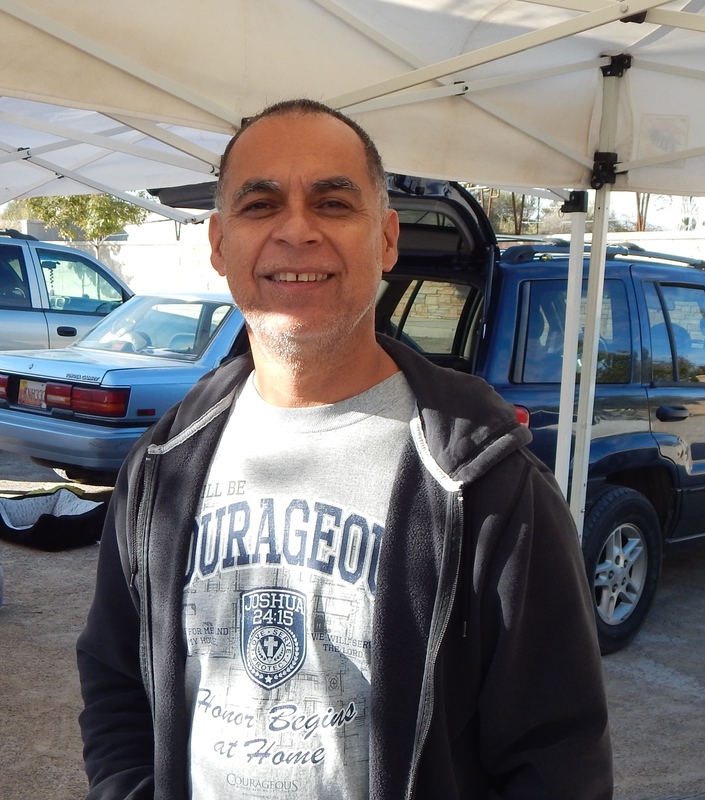 El Paso Master Gardeners will be at Ardovino’s Farmers Market one more week. Over the next few days, I’ll share some of the best treats from the market and some of the many people who have become friends. 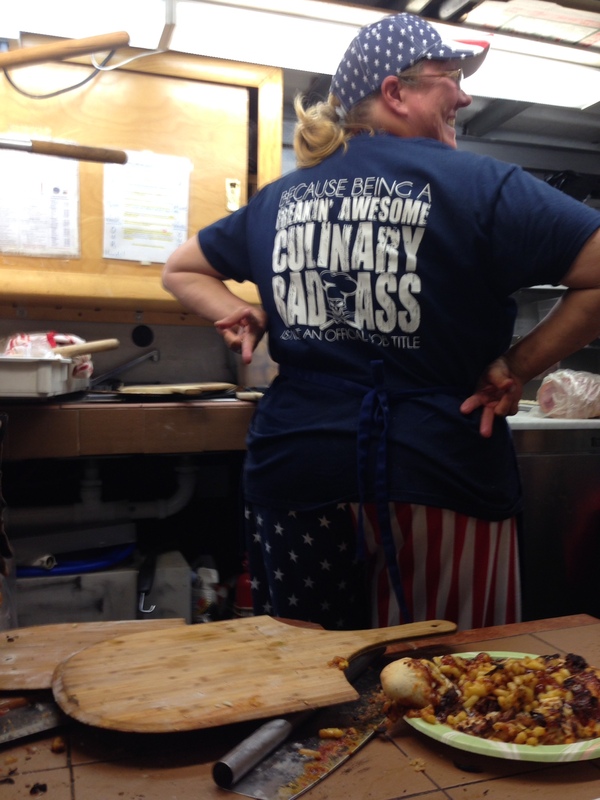 Every thing she’s made that I have tasted has been delicious. My most favorite is her tomato jelly. From my first sample taste, it has had me hooked. Beautiful color, sweet with a little underlying tartness and a favorite part of breakfast! 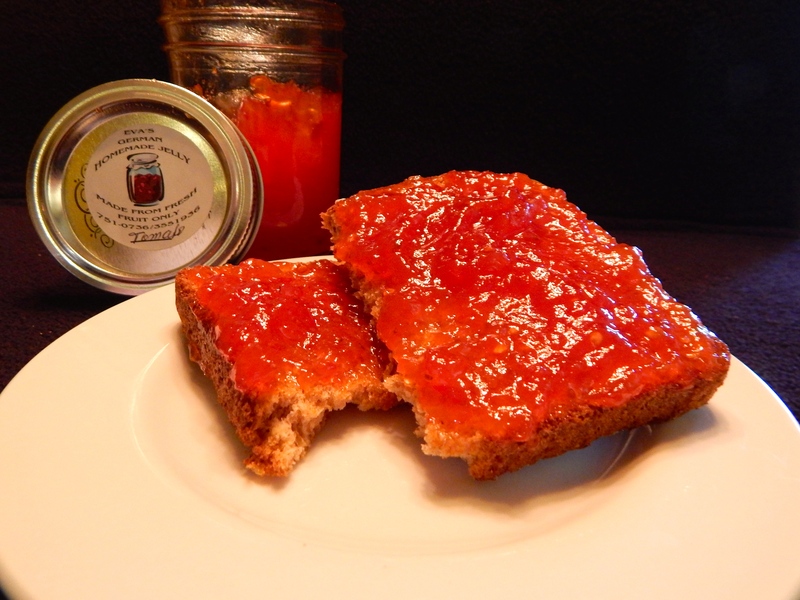 Eva’s Tomato Jelly. 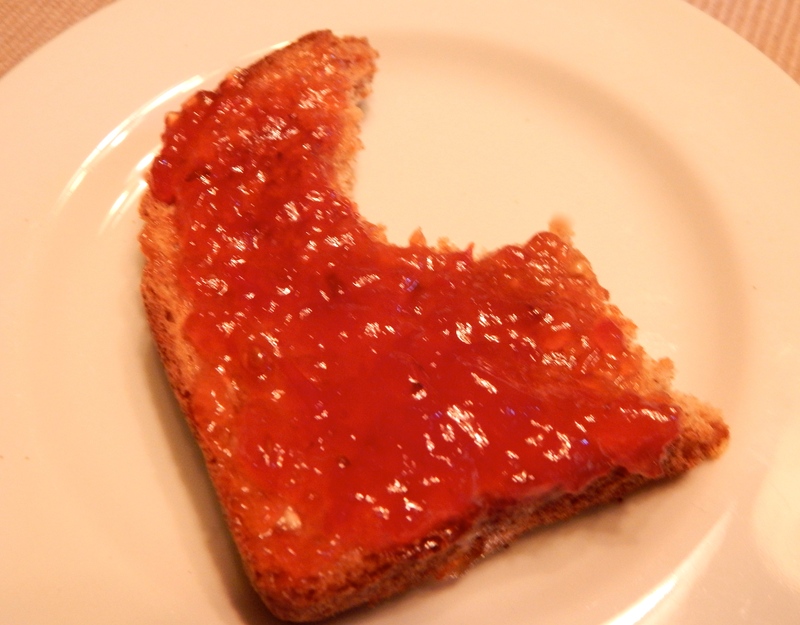 So good it has to be spread edge to edge on toast! Cleaning up after the shoot is a hard job, but someone has to do it. After the photo shoot, I get to clear the set up. Don’t think for a minute I’d let a drop of this jelly go. Visiting Eva will make going to the fall and winter market worth the trip. A couple of days ago, I shared my experiment making a chess and apple quesadilla. Today, I had a quiet morning and decided to give it another go. 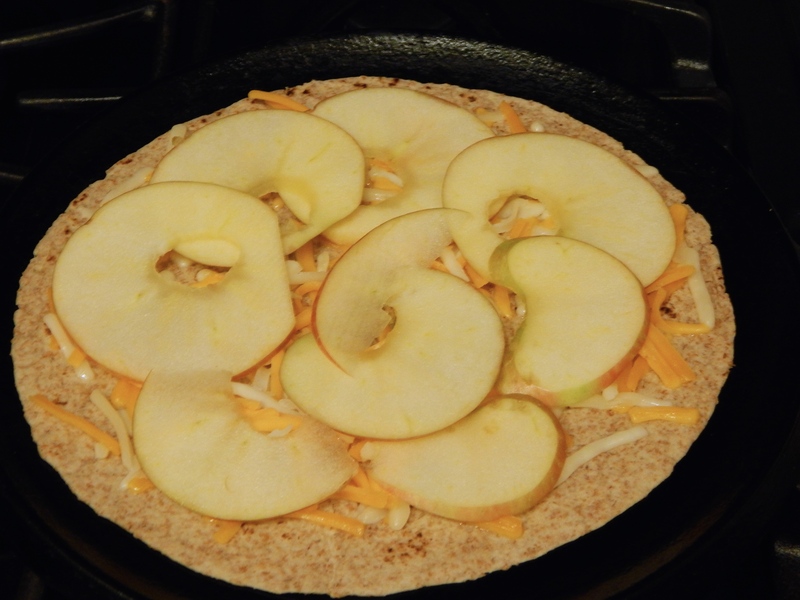 I used the same basic ingredients: multigrain low carb tortillas, a blend of cheddar and jack cheeses and Honeycrisp apples. Instead of a bacon garnish, I used slices of prosciutto, crisped on the comal as one layer of the filling. Crisped prosciutto made the dish! 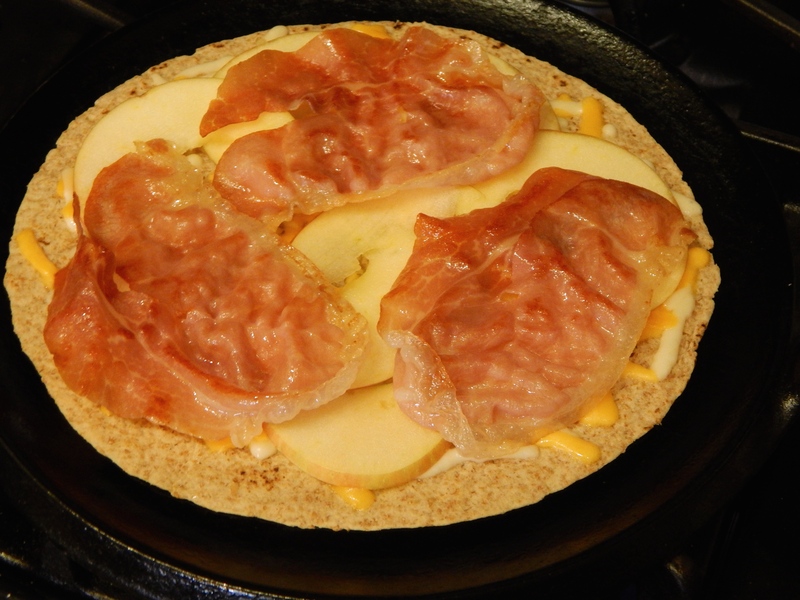 Layers one and two – cheese, then apples on the tortilla. Layer 3 – crisped proscuitto – a mildly salty complement to the apple and cheese. Layer three was topped by more apple slices and cheese and the top tortilla for the quesadilla. I used two layers of very thinly sliced apples to hold their own agains the prosciutto and make the quesadilla a little more substantial than the first version. The light layers of cheese bind it all together which is a big help when turning the quesadilla over to heat and crispen both sides. The apple and cheese quesadilla tastes as good as it looks. A few slices of Honeycrisp were dessert-like after the savory quesadilla. 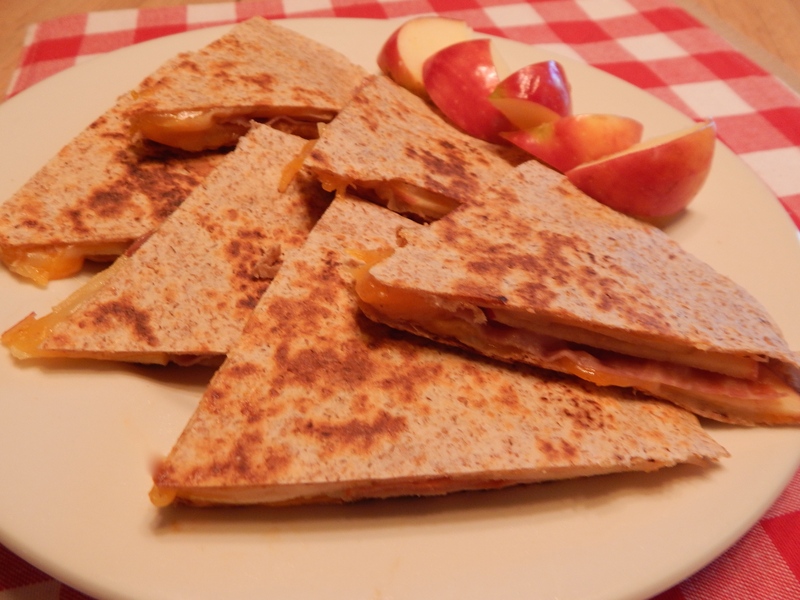 Sliced and plated, the Apple and cheese quesadilla could well become a staple breakfast during Honeycrisp season! How does Brie sound as the cheese next time?